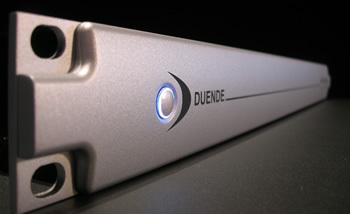 SSL Duende includes channel and dynamics processing and the Stereo Bus Compressor for mastering. These are not native plug-ins; you connect a sleek, silver DSP hardware rack to your computer via FireWire. It’s too early to say whether the resulting product will live up to the hype, and you certainly shouldn’t ask me, since I’m about as far as you can get from a mastering engineer. Audio Damage’s Chris Randall has developed a minor obsession over the gear at Analog Industries, and points to first impressions at gearslutz.com. There is reason to be skeptical, as always, about the ability of digital processing to live up to analog processing. Legendary engineer George Massenburg noted in comments earlier this year that digital compressor emulations lose something versus the analog originals, even as EQs are fairly easily emulated digitally. That makes sense given how digital audio processing works, though I’m sure nothing is likely to resolve the analog vs. digital debate in our lifetimes. The big question here to me is really value, and in that category, the SSL offering will have to compete with other DSP platforms. Universal Audio’s UAD-1, TC Electronic’s PowerCore, and, at the higher end, Digidesign’s TDM platform all have a much broader selection of plug-ins, and there’s the affordable new Focusrite Liquid Channel. I’ll be anxious to hear how Duende fits in, though you can’t beat putting the SSL brand on the faceplate. If you want to win one of these, Music thing gets the scoop on a Peter Gabriel remix contest; the prize is the Duende.